Thyroid, Parathyroid, Adrenal, Endocrine Surgery, What does the Thyroid Gland do? When studied under the microscope, the thyroid gland is composed of follicles. These follicles are filled with a substance known as colloid where the iodothyronines are stored. Surrounding these cells are the para-follicular cells. These cells produce the hormone calcitonin that is involved in calcium metabolism. The synthesis of the iodothyronines is dependent on iodine from the diet. 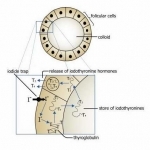 The follicular cells of the thyroid gland concentrate iodine in the form of iodide using an iodide trap. The iodide trap is a pump in the follicles that actively pumps iodide from the blood into the follicles. This is shown in the diagram below. Once the follicular cells have taken up the iodide, it is activated into a reactive form by a peroxidase enzyme. Once activated, this reactive iodine associates with a protein rich in the amino acid tyrosine (called thyroglobulin). Initially, the iodine associates with thyroglobulin either singly or in pairs (mono- or di- units). Then, as a result of coupling reactions, units with three or four iodine ions (tri- or tetra- units) are formed. The protein containing the iodothyronines is then stored as colloid in the follicular cells. 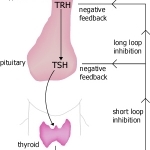 The production of T3 (triiodothyronine) and T4 (thyroxine) is regulated by thyrotrophin (Thyroid Stimulating Hormone - TSH) which is secreted from the anterior pituitary as illustrated in the diagram below. The control of TSH release is by another hormone called Thyrotrophin Releasing Hormone (TRH). The control of this system is by a negative feedback mechanism. TSH stimulates the synthesis of thyroglobulin, the iodide trap, the coupling reactions in the follicular cells and the release of the iodothyronines into the circulation. What do the Iodothyronines (T3 and T4) do? Both T3 and T4 are released from the thyroid, but much more T4 is produced than T3. When released into the circulation, they combine with plasma proteins, mainly Thyronine Binding Globulin (TBG). A small proportion of the iodothyronines also bind to albumin and prealbumin (TBPA). Less than 1% of the iodothyronines are free (unbound) in the plasma. Oestrogens increase the synthesis of TBG and decrease the clearance of the iodothyronines. In states where there are high levels of circulating oestrogens (i.e. pregnancy), there are high levels of circulating iodothyronines. In the peripheral tissues, T4 is converted into the more active iodothyronine T3. This is brought about by a deiodination reaction. T3 is a more potent hormone than T4 but it has a shorter half-life. There is another important conversion in the periphery where T4 is deiodinated to an inactive iodothyronine called reverse T3 (rT3). The precise role of rT3 is not fully understood, but it is thought to regulate the amount of active iodothyronines in the periphery. T3 and T4 increase the basal metabolic rate of almost all the cells in the body. In the presence of high levels of iodothyronines, there is a slight increase in body temperature and a decrease in heat tolerance.In the presence of low levels of iodothyronines there is a decrease in basal metabolic rate and a decreased tolerance to the cold. T3 and T4 increase the breakdown of fat (lipolysis), and high levels will result in a depletion of stores of body fat and a fall in body weight. Low levels of T3 and T4 will result in the opposite. T3 and T4 increase all aspects of carbohydrate metabolism. Iodothyronines stimulate both protein synthesis and degradation. High levels of T3 and T4 will result in more protein degradation compared to protein synthesis. This will result in a fall in muscle mass and body weight. Iodothyronines play an important role in normal growth and development. The iodothyronines have a direct effect on the heart by potentiating the catecholamines. This explains the tachycardia associated with high levels of T3 and T4.When the levels of T3 and T4 are high, the increase in BMR will result in an increase in temperature. There is a physiological increase in blood flow to the skin to try and reduce the body temperature. High levels of T3 and T4 are associated with increased bone turnover. Bone cells are stimulated to both increase bone resorption and bone synthesis. The more profound effect of resorption results in demineralisation of bone and therefore increases the risk of fractures and mineral abnormalities i.e hypercalcaemia. The effects of the iodothyronines on the central nervous system are thought to be due to the potentiation of their catecholamine activity. The iodothyronines are also essential for mental development.